are arc welders or oven elements in series with the transformer. What's the thrill?...other than having a fire within ten feet of Mom's car? Marc, it would be very rare to find a utility transformer that would have been connected phase to phase. The primary on that transformer is in the 8.66 kV class or 15 kV grounded wye. You guess of 7.2 kV is much more accurate and it could be as high as 7.62 kV. Outside of that range is unusual but possible. Some electric utilities work outside of that range, I know of some experimentation with a 23 kV distribution system but (I think) the idea was abandoned. The bottom line is that this boy doesn't have a clue about how dangerous the stuff in his hands can be to him. Hey... hold my beer and watch this! That is stupid I use neon sign transformers on my tesla coil. I wonder how many times "Dude" was used during this experiment. Although I never tried this stunt, I was pretty much an experimental idiot when I was young (probably still am). 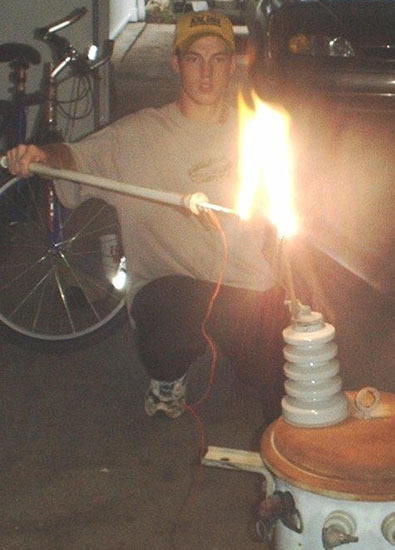 Did any of you others experiment much with electricity as kids? I jambed a screwdriver into an outlet when I was very little...big spark...fuse pop...Mom screamed. She'd always call her friend & say, "I'm going to change a fuse, call back in a few minutes to make sure I'm OK!"